Rare Books and Special Collection at Princeton, holds a Model No. 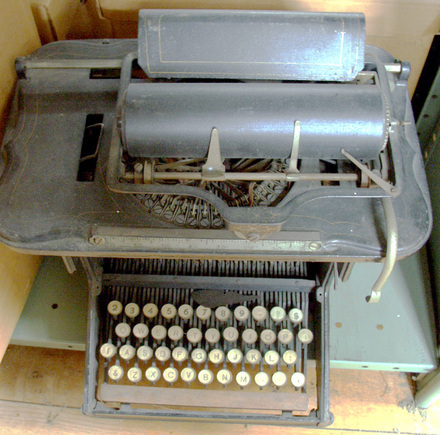 1 Remington Type-writer from 1874. The manufacture of this machine began at the gun works of Eliphalet Remington (1793-1861) in 1873 but the first sales were not made until the following year. Remington called his machine a Type-writer and it wrote capital letters only. Demand for a greater variety of fonts led to a second model in 1878. The young Remington began working as a blacksmith in Kinne Corners, New York, where he invented a new barrel for an hunting rifle. Its success led Remington to build a factory, where he could manufacture the guns himself. Remington & Sons also produced and sold bicycles, farm ploy blades, and sewing machines but it is the type-writers for which they had their greatest success.